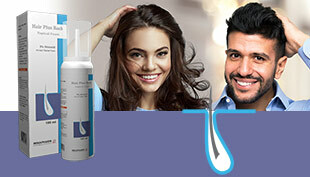 Iron supplementation fot prevention of iron deficiency anemia & treatment of mild anemia. Anemia is a blood disorder. Blood is a vital liquid that your heart constantly pumps through your veins and arteries and all throughout your body. When something goes wrong in your blood, it can affect your health and quality of life. Many types of anemia exist, such as iron-deficiency anemia, pernicious anemia, aplastic anemia, and hemolytic anemia. The different types of anemia are linked to various diseases and conditions. Anemia can affect people of all ages, races, and ethnicities. Some types of anemia are very common, and some are very rare. Some are very mild, and others are severe or even life-threatening if not treated aggressively. The good news is that anemia, most often, can be successfully treated and even prevented. Each capsule contains the equivalent of 80 mg Fe2+) in the form of ferrous(II)-glycine-sulphate complex 454.13 mg and Folic acid 1 mg. The mini tablet (capsule content) contains: lactose monohydrate, sodium starch glycolate, magnesium stearate, cellulose microcrystalline and silica colloidal anhydrous. The granules (capsule content) contain: Ascorbic acid (E300), cellulose microcrystalline (E460a), hypromellose (E464), hydroxypropylcellulose (E463), methaciylic acid — ethyl acrylate copolymer, o-acetyltriethylcitrate, talc, sodium laurilsulfate, polysorbate 80 and purified water. The capsule cap contains: gelatin, titanium dioxide (E171), red iron oxide (E172) and yellow iron oxide (E172). The capsule body contains: gelatin, titanium dioxide (E171), red iron oxide (E172) and yellow iron oxide (E172). 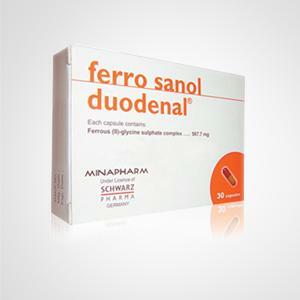 For the therapy of combined iron and folic acid deficiency; in particular during pregnancy and lactation and in cases of malnutrition. Adults and children from age 6 should usually take one capsule a day. In cases of pronounced iron deficiency, adults and adolescents from age 15 or from 50 kg Body Weight (BW) can be given a dosage 2 to 3 times higher at the beginning of therapy A daily dose of more than 5 mg Fe2+/kg BW should not be exceeded. 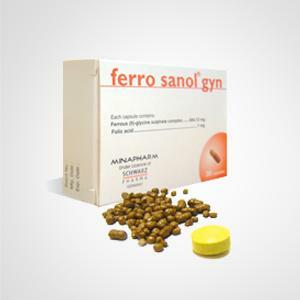 If you have the impression that the effect of Ferro sanol gyn® is too strong or too weak, talk to your doctor or pharmacist. Without chewing, adults and children from age 6 take 1 capsule once daily with sufficient water. The capsules are to be taken at sufficient intervals from meals (for instance, on an empty stomach in the morning or between two principal meals), because absorption can be reduced by ingredients of food. The duration of therapy is determined according to the laboratory follow-up study results. Note: If swallowing of the capsule proves difficult or is not desirable, the capsule contents can also be taken without the capsule body. To do so, open the capsule cautiously over a soup spoon, in which the 300 to 400 pellets are gathered. Drink sufficient water after having taken the pellets from the spoon. Iron deficiency is the most common deficiency state in the world, affecting more than 2billion people globally. Although it is particularly prevalent in less-developed countries, it remains a significant problem in the developed world, even where other forms of malnutrition have already been almost eliminated. Effective management is needed to prevent adverse maternal and pregnancy outcomes, including the need for red cell transfusion. The objective of this guideline is to provide healthcare professionals with clear and simple recommendations for the diagnosis, treatment and prevention of iron deficiency in pregnancy and the postpartum period. This is the first such guideline in the UK and may be applicable to other developed countries. Public health measures, such as helminth control and iron fortification of foods, which can be important to developing countries, are not considered here. The guidance may not be appropriate to all patients and individual patient circumstances may dictate an alternative approach. 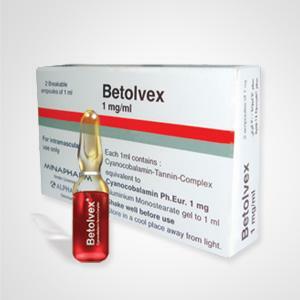 Betolvex is the highest technology in Vitamin B12 preparations, Providing fast onset and the longest duration of action, ensuring replenishment of Vitamin B12 body stores. Iron supplementation for treatment of moderate to severe iron deficiency anemia.